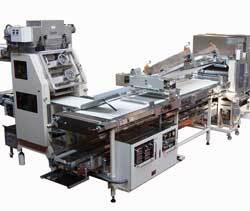 Products Line ['BREAD' Line] | OSHIKIRI MACHINERY LTD.
Oshikiri provides you with a Fully automatic and/or Semi automatic production system for White Bread in compliance with your requirements such as production rate, number of dough pieces per baking tin, shape of the dough panning, etc. State of the Art Design for utmost quality and loss-less production. Oshikiri original PC software enables precise weight compensation even in batch change-over. Provides weight sampling chart, and printing out available. 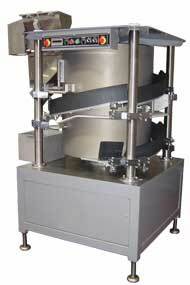 Pressure feed to dough changeable, divides dough with optimum pressure. Sucking stroke of main ram and knife changeable. Sucking stroke of main ram and knife changeable. Flexible setting of dividing mode and timing of each component with a basic program in compliance with dough weight and machine speed. 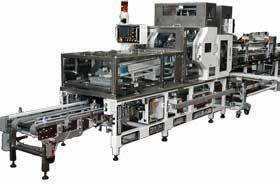 Optional Auto-checker system enables highly precision dividing weight compensation even when batch shifting (only for model DKX & DMX). Replaceable front & bottom plate of dough chamber (i. e. sliding part) just by screwing. Division head does not contact with sliding parts. Replaceable dough chamber just by screwing. Lubricating amount adjustable point by point for auto-lubricator. Components moves to cleaning position by one touch on touch screen. Equipped with cleaning aid device for main ram and knife. Even flip side easily cleaned. Lubricating points decreased by 50% in comparison with our conventional model. Touch screen displays a message for lubrication when it is time. In consideration of dough weight, correlation of the rounding track and drum is designed to achieve optimum rounding effect. The rounding track divided by 45 degree; easy to change rounding length, easy to replace. Special coating applied to the rounding track and the drum. Highly wearable. Infeed at bottom and discharge at top facilitate easy connection with divider and proofer. Longer discharge chute helps appropriate cover of the dough pieces with dusting flour. Hygienic due to the sufficient space between the drum and the support base. Equipped with a discharge chute and a catch box for doubled dough pieces. Resin made cups can be exchanged by one-touch for easier sanitation. Residue Catch Pan is located under drive chain to prevent foreign objects from being mixed. Single operation system continues working even when the prior equipment stops, no dough is wasted. Optimum moulding performance by independent drive and valiable speed for Sheeting Roller and Moulding Belt. 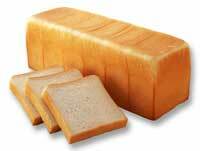 Mainly suitable for large size dough pieces for white bread. Step-by-step sheeting with large diameter rollers minimizes damages to the dough. Lightly moulded since curling line cuts sheeting line at right angles. 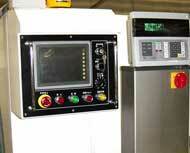 Incorporating the Pressure Board provides more consistent moulding in the shape and quality. Digital indicators for the roller and belt speed and the height of the Pressure Board makes adjustment easy. 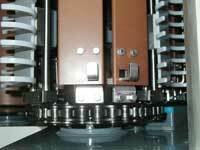 Lift-up mechanism of the optional motor-driven pressure board saves dismantling time for cleaning. The conveyor belt is loosened by one-touch for easier cleaning of its reverse side. Alternative shaping from "M" type, "N" type and "U" type. Deformed dough pieces are automatically removed before panning. Image Sensor and Servomechanism facilitate faster and more accurate panning. Manual shaping is possible when using Bypass Conveyor. 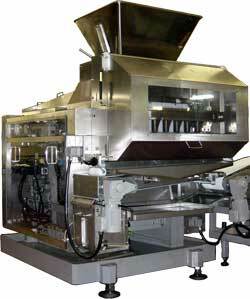 A cover between dough receiving holders is detachable by one-touch for easier cleaning of inside.